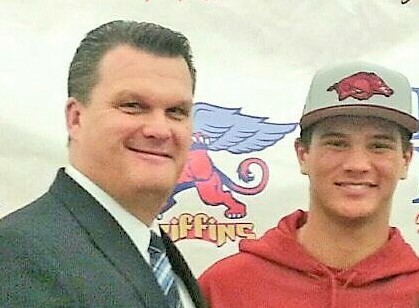 LBPD’s Todd Johnson with Arkansas Razorbacks punter Blake Johnson. I asked whether Johnson is currently assigned to investigate domestic violence cases. This is part of the story I’ve heard, but the LBPD would neither confirm nor deny it. I’m astonished that Johnson continues to be employed by the LBPD in any role, considering that a judge (in yet another case) called his behavior “appalling and unethical and inappropriate.” Suddenly, it appears that the LBPD and the L.A. County District Attorney’s Office have acknowledged that Johnson is too dirty to serve as a homicide detective in Long Beach. Even so, it’s disturbing that Johnson’s supervisors seem to think he’s fit to handle domestic violence cases. 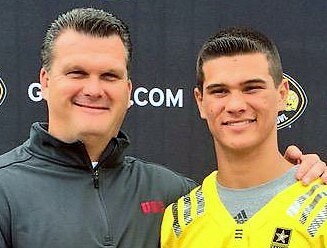 Detective Johnson with punter Blake Johnson. My sister’s case involved extreme domestic violence — a woman murdered in her own home by her husband. Signs of tension and conflict can be seen in surveillance video taken inside their home. Johnson saw it and wrongly concluded that the video showed no issues. Click here to open a pdf of this police report. The statement appears on page five at the bottom of the page. Johnson read it, and ignored it. I told the police that my sister’s husband was abusive, but Johnson dismissed my statements, too. Johnson’s erroneous conclusions, smug dismissiveness, and face-saving coverups helped my sister’s husband get away with murder. To me, Johnson’s reassignment to domestic violence cases shows profound contempt for the people of Long Beach. It shows that the LBPD protects their rotten apples at the public’s expense. Read more about how Todd Johnson botched the investigation of my sister’s homicide here. Arkansas Razorbacks punter Blake Johnson gestures with his middle finger in a game vs. Missouri Tigers.